Carmel Mountain Ranch, sometimes shortened to simply Carmel Mountain, such as on maps, or abbreviated to CMR by local residents and organizations, is a community of San Diego, California, United States, in the northeastern part of the city. Despite its name, Carmel Mountain Ranch is actually in the shadow of Black Mountain. Carmel Mountain proper is about 10 miles west of the Carmel Mountain Ranch neighborhood. 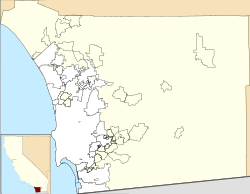 The community is bounded by the city of Poway to the east; other communities of San Diego, Rancho Bernardo to the north; Rancho Peñasquitos to the west; and Sabre Springs to the south. Sears, Petco, and Best Buy are among the biggest retailers in this shopping center; however, there are dozens of others, and a directory can be viewed on the referenced website below. It is the largest in terms of area of the centers. In 1993, the United States Postal Service opened the Margaret L. Sellers Processing and Distribution Center. The facility is over 15 acres and employees over 1,500 people. Sorting mail destined as far north as Fallbrook, and as far east as Tecate, during the holiday season the facility processes over 300 million items. It replaced the Midway Processing and Distribution Facility, in the Midway neighborhood, which opened in 1972 and stopped processing regional mail in 1993; that facility was built on the site of the Dutch Flats Airport, once utilized by Charles Lindbergh prior to his transatlantic flight. Ralph's grocery store, banks, and retail shops are located here. I-15 runs along the western edge of Carmel Mountain, and a noticeable stone marker, complete with sign and flags, is visible from the northbound lanes to act as a gateway immediately before the Carmel Mountain Road exit, which is the primary road serving the community. The eastern terminus of SR 56 becomes Ted Williams Parkway as it enters the community; however, it retains its freeway characteristics until it crosses Rancho Carmel Drive. There are local bus routes. While Carmel Mountain does not share in the name, the Sabre Springs / Penasquitos Transit Station, which provides direct access to the managed express lanes on I-15, is adjacent to the community. Costco Wholesale is the main anchor here; however, there are also smaller stores, such as eateries and a bank. Every year the local Chamber of Commerce, headquartered within the community, hosts a fall festival at which local businesses, community organizations, and school representatives set up information booths and interact with attendees. Every Christmas, graduates from Meadowbrook Middle School host the "CMR Olympics". Fairway Village, a neighborhood division of Carmel Mountain Ranch running east-to-west on Stoney Gate Place, parallel to Ted Williams Parkway and crossed by Shoal Creek Drive, presents an annual Christmas light show called "Holiday Magic at Fairway Village." The neighborhood lights more than 85 homes from December 1 to January 1. Each year on the Saturday before Christmas, the neighborhood holds an evening block party that is open to the public, where visitors can walk through the neighborhood, enjoy the lights and festivities, and partake of snacks and hot drinks offered by many homes. This event has been featured in several San Diego Family magazine articles. The neighborhood is also very popular at Halloween due to it being a large cul-de-sac street with no hills. 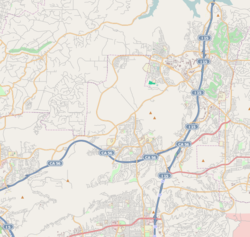 Carmel Mountain Ranch Community Park is located just north of Ted Williams Parkway on Rancho Carmel Drive, just east of the 15. Highland Ranch Park is located north of Eastbourne Road and slightly northeast of Highland Ranch Road. The Carmel Mountain Ranch Country Club sprawls much of the community and is available for golf tournaments, weddings, and other events. The Home Depot is the anchor of this center; however, there are multiple restaurants and smaller shops as well. Carmel Mountain Ranch is served by the Poway Unified School District. High schoolers feed into Mt. Carmel High School or Rancho Bernardo High School. Middle schoolers feed into Bernardo Heights Middle School in Rancho Bernardo, Meadowbrook Middle School in Poway, or Black Mountain Middle School in Rancho Peñasquitos. ^ unestidstwern (22 February 2007). "All roads lead to CMR regional mail center". Pomerado News. Poway. Retrieved 14 July 2018 – via San Diego Union-Tribune. ^ Bouvier, Geoff (1 February 2007). "Where the Mail Goes When it Doesn't Get to You". San Diego Reader. Retrieved 14 July 2018. ^ Himchak, Elizabeth Marie (13 December 2017). "Postal Service is in the midst of 'busiest' time". Pomerado News. Poway. Retrieved 14 July 2018 – via San Diego Union Tribune. ^ Hall, Matthew T. (23 February 2012). "USPS Midway processing plant set to close". San Diego Union-Tribune. Retrieved 14 July 2018. ^ Schwab, Dave (29 January 2014). "Mammoth Midway postal facility back on sales block". San Diego Community News Group. Retrieved 14 July 2018. Freeman, Paul (11 October 2016). "Abandoned & Little-Known Airfields: California: Northern San Diego area". California Pilots Association. Retrieved 14 July 2018. Monteagudo, Merrie (2018). "Never-before published photos of Charles Lindbergh test flying the Spirit of St. Louis". Hoy San Diego. Retrieved 14 July 2018 – via San Diego Union Tribune. This page was last edited on 26 March 2019, at 05:51 (UTC).